The Carrie Dyer home at 4535 Dallas St. sat vacant for more than a year and half. An entire section of the back of the house was missing, and the interior was exposed to weather. The lawn and shrubs were overgrown. It was a mess. The seller bought the property on the courthouse steps and planned to renovate the home, or, worse yet, tear it down. I sent endless texts to the property owner asking if he would consider selling the home as is. After many months, he finally agreed. It was my task to marry the house with the perfect buyer. I knew I had to be careful. The house has such Acworth history. It couldn’t fall into the wrong hands. City staff members were amazing to work with during this process. My list of buyers was dwindling one by one. Either the renovation was beyond their scope, or, they, too, wanted to tear it down. I had until the end of December 2017 to find the right buyer. Someone would need to close on the property prior to Dec. 31, 2017, for tax purposes and due to a dissolving partnership. I started to panic, thinking I was not going to be able to do it. Then, I received the call. Tommy Allegood, our mayor, was accepting this challenge, and would restore it to its original beauty and build an addition. The original Central Hallway cottage was 560 square feet with two fireplaces. The Sanborn Fire Insurance Maps, circa 1920-32, show the home had an addition with approximately 780 square feet. The house today, with the complete renovation, will be more than 3,500 square feet. Writing this article has become a treasure hunt. Records in FMLS reflect the house was built in 1851. It all makes sense now. The six-over-six pane original windows were used in homes from 1830-60. This was a true antebellum home! There are two homes nearby of the same style and architecture. One of the homes is where William Tecumseh Sherman stayed during the Civil War. Acworth historians refer to this home as the Carrie Dyer home. The Club was established in Acworth in 1898 as the Calleopeans, but was renamed in 1901, upon Carrie Dyer’s death, to the Carrie Dyer Reading Club. Later, the club was named The Carrie Dyer Women’s Club. The Club purchased the house in 1910 and used the building as a clubhouse and public library. The group joined the Georgia Federation of Women’s Clubs in 1908, under the name Carrie Dyer Women’s Club. Still active, the club holds the distinction of being the second-oldest women’s club in Georgia. The home was used as a community center and hosted lectures, special events and dances, and served as a meeting place for local organizations, such as the Girl Scouts of the USA. The Club operated a library in the home until it joined the Cobb County-Marietta Public Library System in 1963. The new library was constructed a short distance from the house. 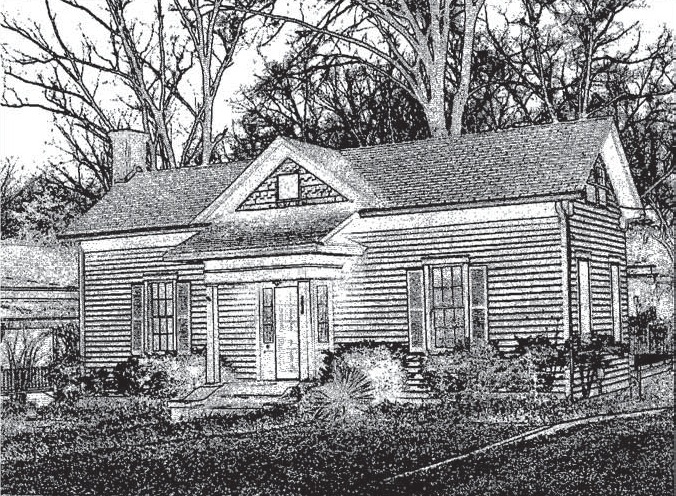 The house is a significant landmark in Acworth. Acworth’s residents wish to protect the buildings, neighborhoods and landscapes that tell our story. This house is an important piece of Acworth history. Thank you, mayor, for taking on this preservation. The Carrie Dyer home will be available for purchase late summer 2018. Sanborn Fire Insurance Maps and Carrie Dyer information courtesy of Abbie Parks and Trevor Beemon. By Malinda Howe , contributing writer and is broker and owner of Anchor Realty Partners. Howe also is vice chairwoman of the Acworth Tourism Board.